Pattern applications are endless, but there are never too many ideas when it comes to brainstorming new uses for your patterns. Here, inspired in part by a wonderful collection of 1000 dresses by Fitzgerald and Taylor, we ran through a few of such ideas. Most of the source patterns are taken straight from the Artlandia Glossary and are included in a free bonus pack (in a vector format, of course) available with a purchase of SymmetryWorks. We did make minor alterations, though. Couldn’t resist a temptation to tweak patterns on mockups when it’s so easy to do with SymmetryWorks LP. We can make the modified patterns available too. If you wish to get exactly these versions, please contact us and we’ll see what we can do. Now, let’s get to work. An animal print goes to a fitted round-neck knee-length sleeveless formal dress which underscores femininity (even within the constraints of business settings) and altogether creates a strong impression of authority. 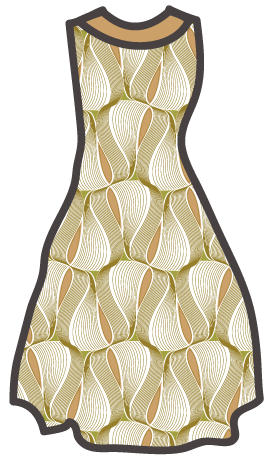 A formal dress with an animal print pattern. 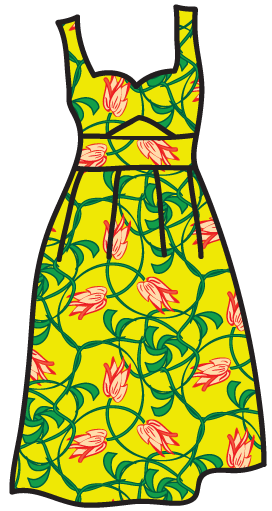 A blotch pattern fits a sleeveless trapeze-shaped low-neckline jumper (pinafore) dress with shoulder straps, or an apron, worn over a blouse. A pinafore dress with a blotch pattern. A Liberty-style pattern works for a sleeveless, body-fitted wrap dress, which is very appropriate for an hourglass figure and can be worn as a day dress. 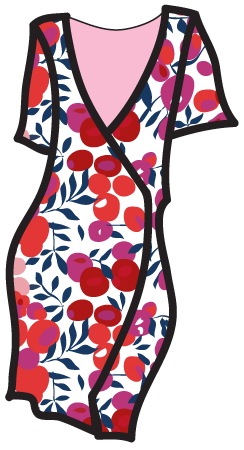 A wrap dress with a Liberty-style pattern. A non-objective pattern suits a fitted-and-flared dress with a tight fitted bodice and pleated A-line flared skirt. A fitted-and-flared dress with a non-objective pattern. A polka-dot pattern, and almost any other pattern with a small-scale set layout, works well for panelling on a sheath-like, body-conscious mini dress. A body-conscious mini dress with a polka-dot pattern. 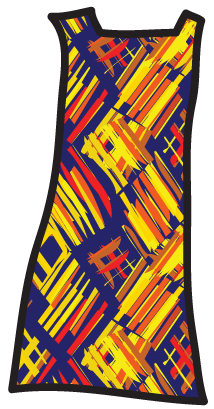 A vibrantly colored abstract print goes on a sleeveless shift dress with A-line skirt. 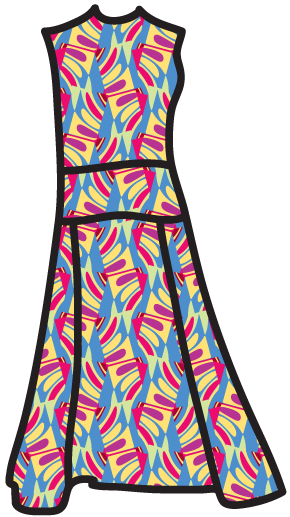 A shift-dress with an abstract pattern. Gradation patterns, and particularly gradation-and-scale patterns, work well on a structured, wide-neckline sleeveless-shouldered A-line dress split along the underbust seam. An A-line dress with a gradation pattern. An airbrush pattern printed on a lightweight silk fabric goes to a circular-cut spaghetti-strap trapeze dress. 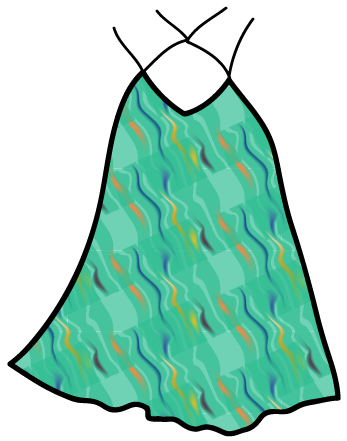 A trapeze dress with an air-brush pattern. A plaid design suits a classic high-neckline fit-and-flare shirt dress with keyhole openings in the front bodice and front-placket ending below the bust. 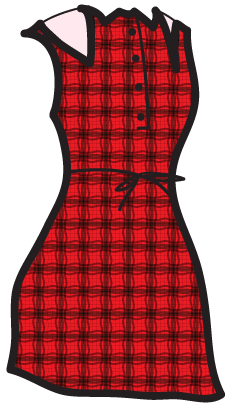 A shirt dress with a plaid pattern. 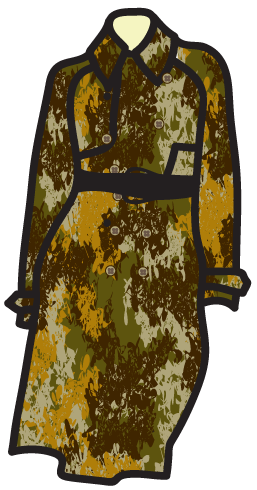 A camouflage pattern is ideal for a loose-fit, double-breasted trench-style safari dress with storm flaps. 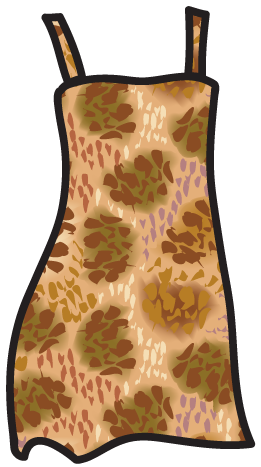 A safari dress with a camouflage pattern. A timeless Art Nouveau pattern goes to a sun dress with a fitted bodice and a sweetheart neckline and a dirndl skirt. 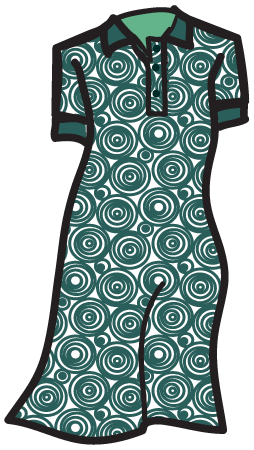 A sun dress with an Art-Nouveau pattern. An eccentric pattern adds sophistication to a fit-and-flare tea dress. A tea dress with an eccentric pattern. Geometric patterns, such as gradation patterns, among many others, suit a tank dress. A tank dress with a geometric pattern. A bull’s eye pattern adds an additional dimension to a traditional polo dress flared to the hemline. 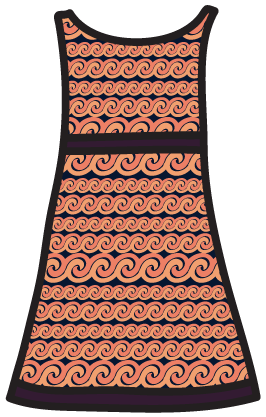 A polo dress with a bull’s eye pattern. Many small-scale geometric patterns (we used an irregular repeat) look perfect on a tube (sheath), body-conscious, form-fitting dress. A tube/sheath dress with a geometric pattern. A dotted-swiss pattern perfectly suits a dramatic long-sleeved Grecian cocktail dress that covers one arm and leaves the other arm bare. A Grecian dress with a dotted-swiss pattern. Did you like some of these ideas? Wish to see more? Leave a comment or contact us directly. This post is a part of our series on pattern applications. The next post is about using patterns in webpage design. You are right. There have so many dress pattern, but when we try to make something new, like using different color shade or trying to mix pattern, then we got confused which pattern will be perfect for us. 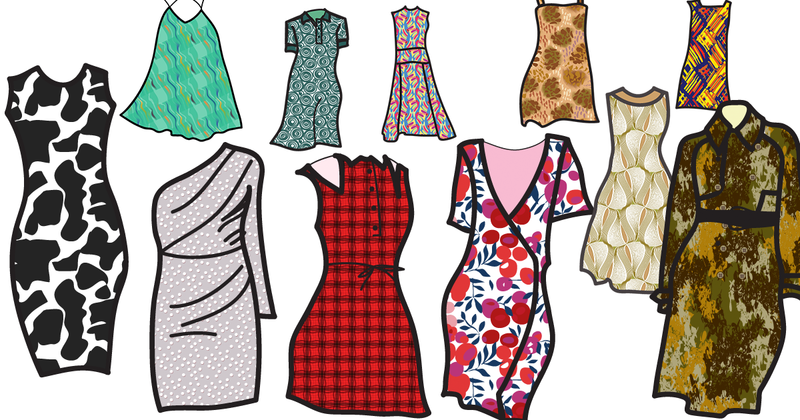 These designs will help us to make a new style dresses. Thanks for this informative article. You may use basic HTML tags, including <b>, <i>, <strike>, and <blockquote>.